Recently, Sharp became the latest multi-faceted electronics company to get into the American smartphone game. In conjunction with Sprint, it launched the Aquos Crystal phone, a 5-inch, bezel-less Android handheld that will be available both as a contract phone and a pre-paid option for Virgin and Boost Mobile customers. The Aquos Crystal is undoubtedly a flagship phone, but it will be available at a budget phone price. Sprint customers can get it for $19.99 with a two year contract, $0 down and $10 per month on Sprint's Easy Pay, or $149 outright on Boost and Virgin. That price makes the phone, which already has an impressive standout feature, even more attractive. The bezel around smartphone screens has gotten smaller and smaller each month as makers try to fit in large displays without making the phones themselves larger. 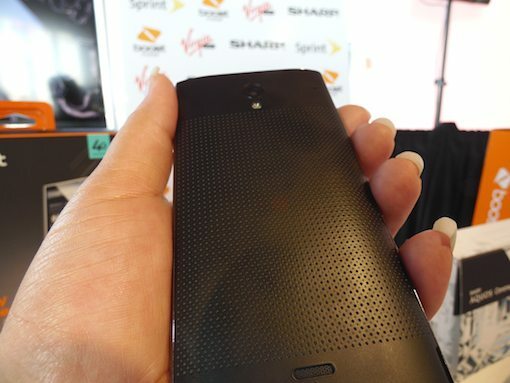 Sharp found a way to eliminate the bezel on three sides, leaving just a small chin at the bottom. The edge-to-edge display is visually pleasing and a little jarring. My eyes kept expecting to see a small border around content--nope, just air. That's pretty awesome. This, plus the overall design, gives the Aquos Crystal an air of refinement not often found in low-cost phones. It's not the thinnest or lightest smartphone available, but it doesn't need to be. More importantly the lack of bezel makes it narrower than other phones with a similar sized display, something that will appeal to people who prefer to use just one hand. The back is curved just enough for a comfortable and secure hold when doing so. The top bezel is usually where you'd find the earpiece and front-facing camera. On the Aquos Crystal the entire screen acts as a speaker, so wherever you put your ear you can hear the caller. You'll also hear really good quality sound as the phone includes HD Voice technology. The main speaker is on the back and is helped along by Harmon/Kardon's Clarifi, which also made an appearance in a special edition HTC One M8. You can't expect the high level of sound quality as you can get on that phone with the setup here, of course. It may mean you won't need a separate MP3 player. As to the front-facing camera, it sits on the bottom. While this doesn't seem ideal for selfies, the camera app prompts you to turn the phone upside down before you take them. Once you get into specs it becomes clearer why this phone is only $149. The display has a 720p resolution--HD but not ultra high res. The quad-core processor is backed by just 1.5GB of RAM and inside there's only 8GB of internal storage (much of which will be taken up by the operating system and pre-loaded apps). Adding a microSD card will give you extra room for pictures, music, video, and other files, but since Android 4.4 puts a ton of limitations on moving apps there, that's not helpful when apps are taking up a lot of space. 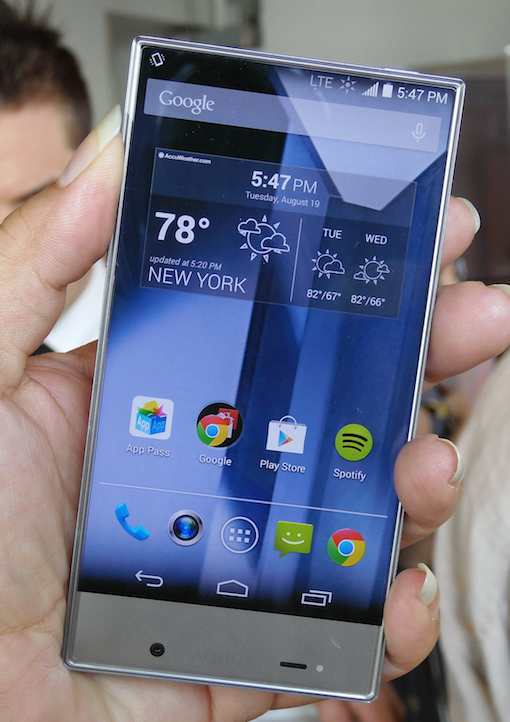 Speaking of Android: Sharp didn't put a skin/different interface over the OS, so you get a mostly stock experience. There are quite a few Sprint apps and other pre-loaded software which wouldn't be so bad if they weren't taking up limited space. Aside from that issue, the Aquos Crystal from Sharp is a very desirable phone at a very desirable price. It's worth checking out, especially if you're going with one of the pre-paid options.